Welcome to the potato grenade (some call it potato “bomb”). Now what is this culinary delight? 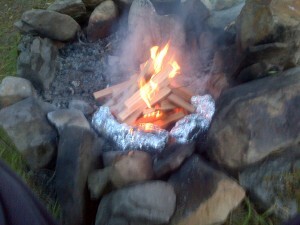 Stuffed baked potato, but you can do the preparation the night before you leave for your campsite. 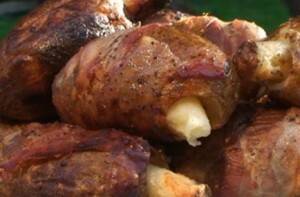 Simply take an apple corer to a potato and stuff the hollowed out core with your preferred filling. Take the cored out centre, cut off the ends and use these as plugs to stop the stuffing from leaking up. Wrap your potato grenade in tinfoil and you’ve a perfect ready meal to cook on your first night bonfire. Get your campfire going after your hammock is set up, throw the tinfoil bundles on the fire, and you’ll have about 40 minutes to potter or just chill out until a hearty meal is ready. While baking potatoes are perfect to use, I prefer sweet potatoes, and as with anything in life, they’re better wrapped in bacon! diced chorizo, cheddar cheese and garlic butter. Cooking time varies according to the heat of your fire. An easy way to check without burning your fingers is to squeeze the tinfoil bundle with your tongs. If you come up with more creative filling ideas, please post a comment. Did you know? Stinking Bishop cheese gets its name from Mr Bishop, who used to supply pears to the cheese maker. Cheese rounds are soaked in pear juice add to their flavour. Mr Bishop didn’t have an odour problem, but a rather intemperate disposition. If you haven’t had stinking bishop before, be prepared for a scent of teenage trainers which will contaminate your rucksack, car, fridge and anything it comes into contact with. Wrapping in cling film does little good, but “oh man” it tastes amazing.